Ultimate Fighting Championship (UFC) champion Georges St-Pierre (center) danced to the clamor of the "madlang people" on Showtime. He will have a mixed-martial arts clinic this Saturday at the SM Mall of Asia Music Hall at 2:30 pm. 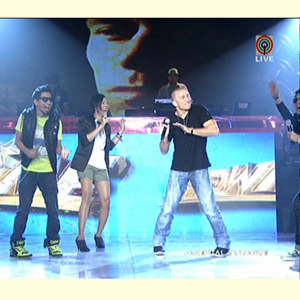 With him are Showtime hosts Teddy (left), Vice Ganda (middle) and Jugs (partially hidden). No one, not even UFC (Ultimate Fighting Championship) champ Georges St-Pierre or GSP, escaped the clamor of the "madlang people" for a sample dance number in ABS-CBN’s Showtime earlier today, September 24. All in the spirit of fun, GSP moved to the beat of the music and of his screaming fans. He is here in Manila for a three-day visit to promote UFC on Balls Channel. He had a press con, guestings in both TV and radio and will have a public training at the SM Mall of Asia Music Hall at 2:30 pm. His December 11 (December 12 in the Philippines) fight with challenger Josh Koscheck will be broadcast locally by Balls Channel SkyCable 34.